On this website you will find thousands of records relating to the genealogy, history, traditions, culture and archaeology of the Western Isles (or Outer Hebrides), a chain of islands off the west coast of Scotland. The material is drawn mostly from the archives of local historical societies (comainn eachdraidh) and other member organisations, with valuable input from Hebrideans and their descendants around the world. 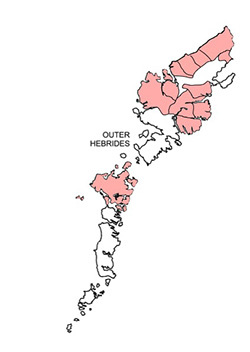 At the moment, information is being contributed by organisations extending from the north of Lewis to Benbecula. Information about using the site can be found below. This website was developed in collaboration with Aberdeen University. In the past, the Hebridean Connections project has been supported by the Scottish Government’s People & Communities Fund, the Heritage Lottery Fund, Comhairle nan Eilean Siar, the Scottish Council for Voluntary Organisations, and Highlands & Islands Enterprise. As of 1st April 2016, Hebridean Connections was integrated with the Heritage Service of Comhairle nan Eilean Siar (CnES), the local authority responsible for the Outer Hebrides. Air an làraich-lìn seo gheibh sibh na mìltean de chlàir a tha a' buntainn ri sloinntearachd, eachdraidh, beul-aithris, dualchas agus àrc-eòlas sna h-Eileanan an Iar. Is iad tasglainn nan comann eachdraidh agus tasglainn bhuidhnean eachdraidh eile na tùsan fiosrachaidh as cudromaiche, le cuideachadh luachmhor bho mhuinntir nan eilean agus an sliochd air feadh an t-saoghail. Aig an àm seo, tha buidhnean bho cheann a tuath Leòdhais gu Beinn nam Faoghla a’ cur fiosrachadh ris a’ phròiseact. Gheibh sibh fiosrachadh gu h-ìosal air mar a chleachdas sibh an làrach. Chaidh an làrach-lìn seo a leasachadh ann an co-bhonn le Oilthigh Obar Dheathain. Chaidh pròiseact Ceanglaichean Innse Gall a mhaoineachadh le Riaghaltas na h-Alba (Maoin Sluaigh is Choimhearsnachdan), Maoin Dualchais a' Chrannchuir, Comhairle nan Eilean Siar, Comhairle Bhuidhnean Saor-thoileach na h-Alba, agus Iomairt na Gàidhealtachd 's nan Eilean. Bho 1 An Giblean 2016, bha Ceanglaichean Innse Gall mar pàirt den Seirbheis Dualchais aig Comhairle nan Eilean Siar (CnES). To access our records, click on 'Browse Records' (top of this page) and choose a record type, then look through the table of records until you see something of interest. Note that 'Sound Files' have been renamed 'Media Files' as we are introducing video content. If you know what you're looking for, use the search box associated with each record type or the one at the top of this page. If you want to search for people by where or when they lived, click on ‘Browse records’ and choose ‘People’. To find possible alternative first names for people, follow the link below. If you search for a place and can't find it, try our gazetteer for alternative names and spellings. Use 'Map Search' (top of this page) to find places: search or zoom and click on the red pins to link through to the records. Our records are all interlinked, and you can navigate between them using the links at the right-hand side of each record. To add your own information or images to a record, submit a comment. You can also view a more detailed map.